Microsoft provides a free virtualization tool named Windows Virtual PC for Windows 7, together with a pre-installed and pre-activated Windows XP SP3 virtual machine called Windows XP Mode. Windows Virtual PC (VPC) and Windows XP Mode (XPM) integrates seamlessly with Windows 7 Explorer, allowing virtual applications to be run from host’s desktop via RemoteApp. Windows Virtual PC has only limited feature sets though. All management of virtual machines, including creating, configuring, deleting or removing and launching or running the virtual machines is done via special folder of Windows Virtual PC. For users who want to copy, clone or duplicate a virtual machine, the task becomes slight complicated, where users have to perform all VM duplicating and cloning steps manually. 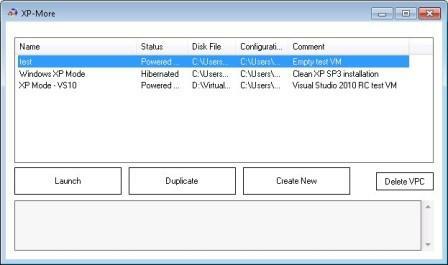 With XP-More, the virtual machine duplication or closing process can be done with just a button click away. XP-More is a free and portable tool, which helps to manage virtual machines, including Windows XP Mode on Windows Virtual PC. There are many cases and instances where users may want to create a copy of existing virtual machine. For example, users may want a new environment where you can test-drive a software without messing up existing running virtual server, or users may want to create a backup of an existing installation before making some changes. XP-More is an open source project, and is available for free download via CodePlex under the GNU General Public License version 2 (GPLv2).